Treasure Maps: On Safari...in Llanfair P.G! 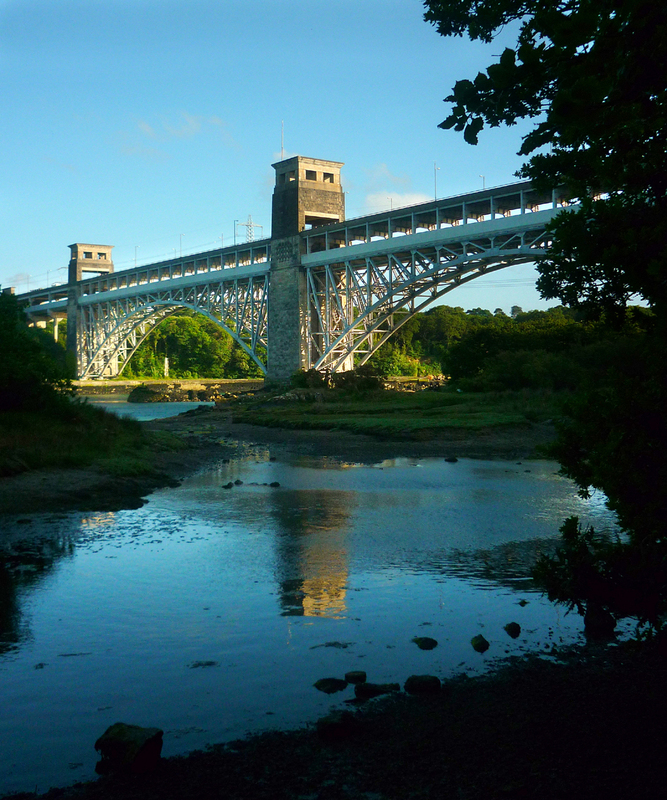 I have a memory, as a young boy, of being able to glimpse the stone lions on the Britannia railway bridge from the road out of Llanfair P.G. This was a little while before the bridge was burnt down. As we all know, after that, a road bridge was imposed upon it, and then it became surrounded by dense foliage. 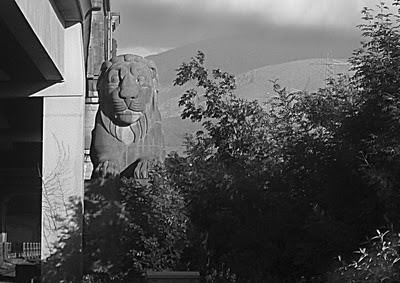 Nevertheless, I'd always fancied trying to get up to the lions, so when Petra and I found ourselves in Llanfair one evening recently, I suggested a little safari. It's not a difficult or particularly strenuous trek. You start from the lay-by before the bridge junction on the Llanfair side, coming from the town. There's ample parking and in summer the place is full of people, all taking the same picture of Telford's Masterpiece. Well, why not? It looks fabulous from here. But we had some wildlife to capture on film, and only an hour's light. The path to the Britannia bridge starts through the kissing gate at the bridge end of the lay-by. A pleasant walk takes you down to the shore, which the path follows for half a mile or so. The woods here seem to be well managed, constantly offering up spectacular views of both bridges. 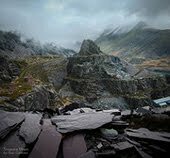 The photos have all been taken before, of course, but there's the challenge- to find the weather, light and compositional elan to manage something different. I didn't...this time. After walking for a few minutes the bridge became increasingly larger and more impressive. The noise of cars and trucks, constantly crossing the roadway above began to drown out the birdsong as we came to a fork in the path. We took a quick detour left and explored the piers of the bridge, craning our necks to look up and wonder at the size and weight of steel and masonry. The bridge was filmed a while back for the BBC "Coast" programme, and we discovered the door leading into one of the piers, but alas, it was securely locked. 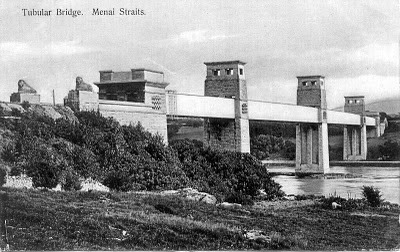 Apparently, Network rail are very jumpy about access to the bridge (not surprisingly) and don't even let the people of the Menai Bridges Heritage Trust in for a look. Undeterred, we made for the higher ground, where lions might be waiting. The track ramped up steeply through the woods towards the bridge. 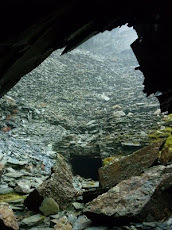 After a short but sharp climb we came to a flat area underneath the roadway and realised that this was the level of the railway. Then, we saw them. 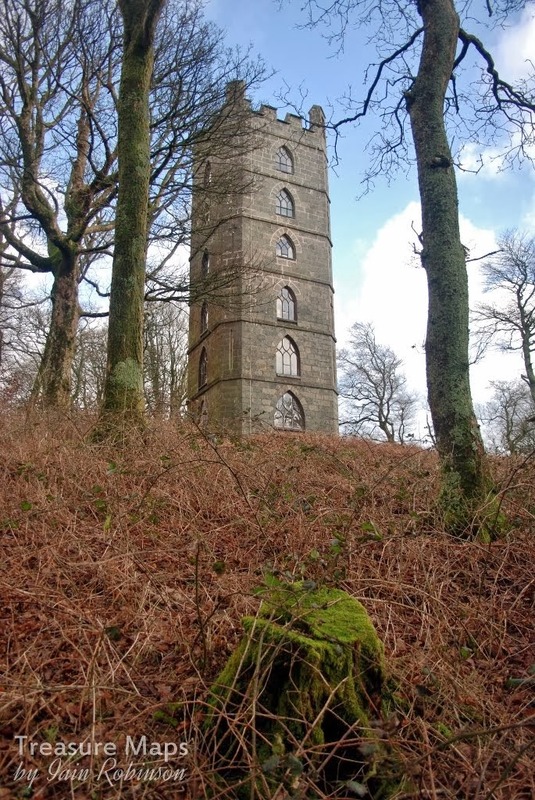 Even dwarfed by the roadway above, they were still imposing and dignified. Sidelined, hemmed in by fencing and foliage, they gazed impassively out as if still guarding the bridge so that Fowler Royal Scot class 4-6-0's could pass safely through with the Holyhead mails. They must have had a night off when those boys came along looking for bats. I'd rather not explore just what those fatheads were really doing on the bridge that night, but they made it past the lions, ushering in a new chapter in the bridges' history. I was impressed, close up to the sculptures. They have a modern feel to them, as if carved in the nineteen thirties. The sculptor was John Thomas, 1813-1862, a little known name today, but famous in his day. He had made several important works, before the lions. The Atlas Fountain, at Vanbrugh's Castle Howard in Yorkshire is possibly the best known. He had also made eight allegorical statues at the 1847 Euston railway station, representing the cities served by the line. Sadly, these are lost, as the buildings were destroyed in the early 1960's to make way for the featureless and uninspiring buildings occupying the Euston site today. 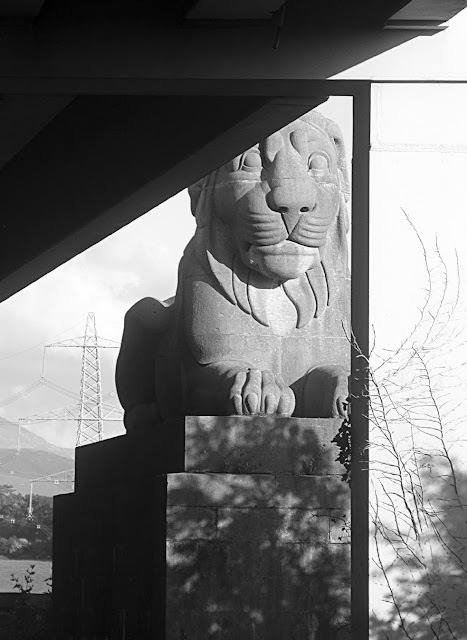 Thankfully, these lions are still with us, and while official vandalism can never be ruled completely out, their future seems secure, if a little ignominious, tucked away in the gloom under the road deck. A train passed while we were there, a soulless diesel multiple unit, but I almost felt that I saw the lions brighten up a bit. They won't be taking any more nights off.